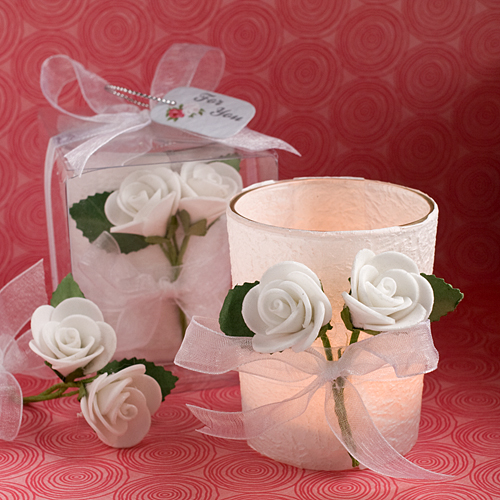 A symbol of innocence, purity, sympathy and spirituality, these white rose candle favors can be given at just about any important ceremony. Each candle measures 2 ?? x 3? and features a clear glass votive holder, elegantly wrapped in a textured white paper and adorned with two cloth white rose blooms side by side, with green stems and leaves, wrapped and tied with a white organza bow in the front to create the look of a bouquet. Each comes in a clear gift box with white tea light candle included, tied with a white organza ribbon and an attached rose themed ?For You? tag.